This is one of the most important resistance actions in the country and it’s great to see it growing. The Blockade is preparing for more and larger actions with a training from January 3rd to 8th and they are asking people to join them. We hear from those who have attended that it is a rewarding experience. If you can’t be there, you can support them by sending them some of the items on their wish list. This week there was at least a temporary victory when a judge stopped pipeline work on one property owner’s land after he sued alleging fraud – TransCanada claimed they’d be transporting crude oil when in fact they will be transporting a toxic sludge of chemicals mixed with Tar Sands. The students at Cooper Union in New York City are another example of effective and creative resistance. They occupied a suite at the university to bring their message of free tuition for all out to the community, resulting in large nonviolent protests outside and intrusion into a closed board of trustees meeting which they live streamed. The students are part of an international movement, a global struggle for education in the information society. Margaret Flowers and Kevin Zeese interviewed one of the students from Cooper Union on Clearing the FOG radio while he was sitting-in. The show covered the college tuition crisis and examined the predatory practices of college loan providers and for-profit colleges. Look for an article in Truthout today or tomorrow that explores this issue in-depth. The students at Cooper Union and Occupy Sandy Relief have been able to show that the police do not have to be in conflict with Occupy. Both efforts had positive relations with the police and are getting the job done. Many of the organizers of the Occupation at Freedom Plaza have volunteered for the Occupy Sandy mutual aid effort and have been impressed by their organization and commitment. They continue to have urgent needs. It’s easy to volunteer or make a donation. Visit Occupy Sandy to see how. Labor battles are on the rise. 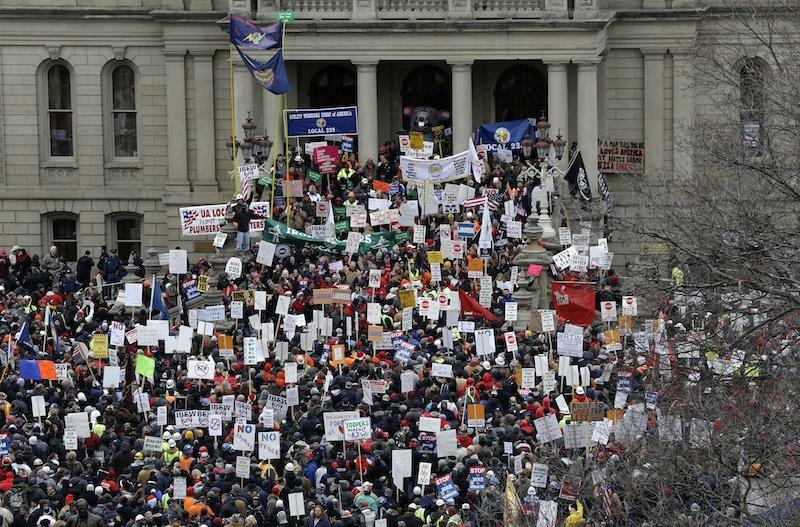 This week in Michigan, the conservative corporate legislature and governor passed a right to work law that weakened union rights. Thousands protested, including many from Occupy, and riot police attacked the peaceful protesters. A large crowd of fast food workers rallied in Times Square last week as part of a walkout of low-wage workers. When a single mother lost her job because she joined the protest, solidarity actions by her community resulted in her being rehired. It sounds good until that last italicized clause. Senators Lindsey Graham, R-S.C., John McCain, R-Ariz., and Carl Levin, D-Mich., all claim that Congress’ has the power to detain citizens. There is no question that non-citizens in the U.S. can be detained. The House still has to vote as their version does not include this provision. In the end, because the language is so vague, it is likely that the courts will have to interpret the law and decide whether it is constitutional. Laws such as the NDAA have not stopped important protests. Stalwart opponents of the U.S. drone program, many of whom were involved in the Occupation of Freedom Plaza, protested at the CIA recently. 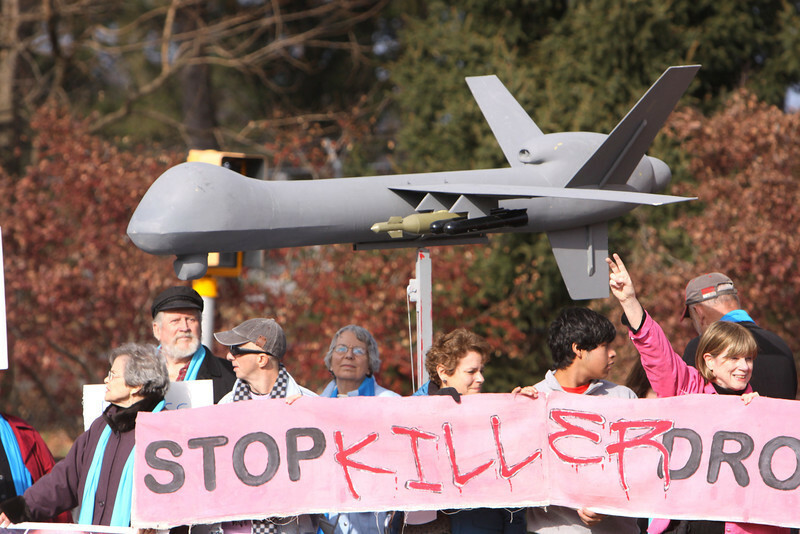 In fact, actions to stop US drones attacks, which mostly terrorize and kill civilians, are growing across the country. Occucards has an informative card about drones and many other issues. These make great handouts to educate people in your community. There is so much going on! We hope that this information is helpful to you. Please help us support these important actions by sharing this email with others.